Arrows fly, swords clash, nobles and church men are gulled out of their coins, and the French and Venetians are successfully blamed for things they did not do. 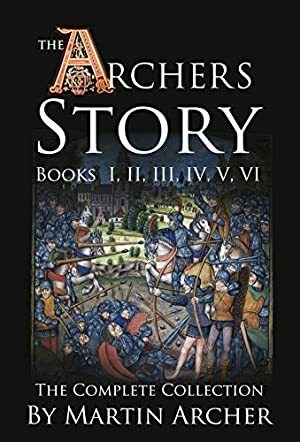 This is a collection of the entire first six books in Martin Archer's exciting and action-packed saga of Cornwall's Company of Archers at the dawn of Britain's military supremacy and the beginning of its great merchant companies. It is an enjoyable and sometimes witty read that sticks pins into the church and nobility along the way. The on-going saga of the Company of Archers is set in dangerous and gritty feudal England during a time when there was great upheaval in Britain as the barons rose against the king, the Saracens were lashing out against the Christians for breaking a truce, and Islamic pirates from the Barbary Coast were fighting for control of the Mediterranean. This is British and English historical fiction at its action-packed best. It will appeal to the fans of books such as The Game of Thrones and authors such as Bernard Cornwell, Jeffrey Archer, C.S. Forester, Griff Hosker, Peter Darman, and Jerry Auteri. Track It. This book has been £1.99 within the past year. Log In to track Martin Archer on eReaderIQ. to be notified each time the price drops on any book by Martin Archer. to stop tracking Martin Archer. We started tracking this book on January 13, 2016. This book was £5.95 when we started tracking it. The price of this book has changed 14 times in the past 1,191 days. The current price of this book is £5.95 last checked 9 hours ago. This lowest price this book has been offered at in the past year is £1.99. The lowest price to date was £1.99 last reached on February 10, 2019. This book has been £1.99 one time since we started tracking it. The highest price to date was £5.95 last reached on February 17, 2019. This book has been £5.95 8 times since we started tracking it. We last verified the price of this book about 9 hours ago. At that time, the price was £5.95. This price is subject to change. The price displayed on the Amazon.co.uk website at the time of purchase is the price you will pay for this book. Please confirm the price before making any purchases.